GERMANY: ARMING NIGERIA AMOUNTS TO ARMING TERRORISTS: BE WISE!!! At this moment, it is pertinent to bring to the knowledge of German government and it's people to the continued and unabated abuse and violation of Human Rights by the Nigerian security agencies and the pretence of the government in protecting it's citizens. 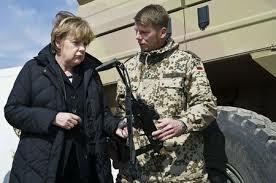 There is every need for the German government to shelve their plans to send military hardware support to Nigerian government which President Buhari claim would be used to fight Boko Haram and tackle the insecurity in the so called Niger Delta region. This is due to many reports indicting the Nigerian security agencies for violating Human Rights. This is evident in the recent killing and maiming of unarmed Biafran protesters in states of former old eastern region of the country. Even in the North, the Army have also been found guilty of killing shiite Muslim Brotherhood group who were observing their religious rites when they opened fire on them and killed thousands. The Buhari-led administration is perceived to be insincere in its approach to certain issues, since inception. He asserted that he will not treat the people that voted for him by a 95% margin in the general election the way he will treat those that voted by a meagre 5%. This is the main reason why he has pardoned so many Boko Haram terrorists who were arrested prior to his ascendancy to the throne. It is important I remind Germany Buhari's response in an Interview done by CNN asking him how he planned to tackle Boko Haram, whether he would hit them hard? He scornfully asked the interviewer, "hit them with what?". Hitler Buhari during the previous administration, criticised the government for using military force against the Boko Haram terrorists, he was quoted as saying, “attack against Boko Haram terrorists is an attack against the North". Buhari has franchise in Boko Haram and is sympathetic to them. Ever since he was sworn in as President, he has been treating Boko Haram terrorists with kid gloves. He is bent on annihilating the region that did not support his election to office. The German government should know that any military assistance given to the Nigerian government will be used to unleash crimes and atrocities on innocent people, especially the Biafrans who he has sworn to crush if they should rise in his administration for self-determination. The Nigeria combined security agents have recently on 30th May, 2016 carried out another genocide on unarmed Biafrans who gathered to remember their fallen heroes and Heroines. More than 700 youths died and scores sustained various degrees of bullet injuries. No sane government will support a country that has no respect for human lives and as such, German government and the German people should rescind the move to give military support to Nigeria. Arming them means arming Boko Haram terrorists. Arming them means supporting genocide and you must be ready for the consequences. We appeal to all men of goodwill and lovers of humanity, the international community, to investigate these reports before thinking of supporting another orchestrated genocide on humanity in that part of Africa.